This tiny venue (which is actually the second-oldest blues club in town) has gone through many incarnations over the decades, during which time it has hosted everyone from Nat King Cole, to Ray Charles, to Ben Harper, all on a compact stage under a signature LP-covered ceiling. No one remembers much about the origins of one of the diviest dives in the South Bay (especially not the dudes at the bar downing buckets of King Cobra and $3 cinnamon whiskey shots), though we do know that from 1905 to 1908 the building housed the San Pedro City Hall, and the former jail cells are still rumored to exist just below the jukebox. 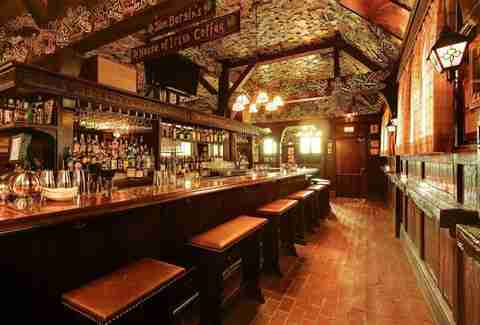 One of the best Irish pubs in the country and the “House of Irish Coffee”, Tom Bergin's first opened as "Tom Bergin’s Horseshoe Tavern & Thoroughbred Club" in 1936 on Wilshire, where LACMA now stands. When horse-lovin’ Tom needed more room for a restaurant, he moved the original fixtures to the current location in 1949, including the huge, horseshoe-shaped bar, which was carried up Fairfax by, uh, over-partied patrons. Following a brief series of closures, the most recent facelift thankfully maintained classic details, like the iconic ceiling full of shamrocks featuring the names of regulars -- a tradition started in 1950 -- including Cary Grant, Bing Crosby, and Kiefer Sutherland (obvi). 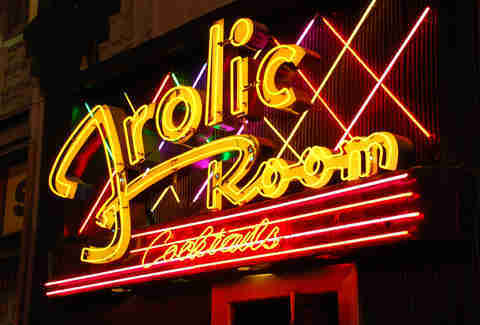 Rumored to be an uber-exclusive speakeasy lounge, opened by a dude allegedly named “Freddy Frolic”, for vaudeville performers at the adjoining Pantages Theater (reachable through a now-bricked-up side entrance) in 1930, the Frolic officially opened to the public in ’34. 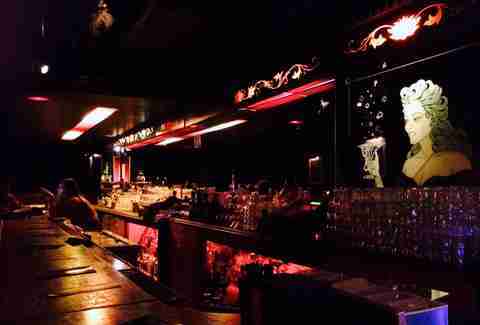 A Charles Bukowski favorite and possibly the last stop for the ill-fated Elizabeth Short (aka the Black Dahlia), the space holds Art Deco neon and vested bartenders that continue to welcome fans of small, dark dives, cheap pours, and strange murals that feature caricatured celebrities. This classic Hollywood haunt has been liquoring up the stars since the days when Chaplin and Douglas Fairbanks used to stumble back to their United Artists studios across the street after happy hour. 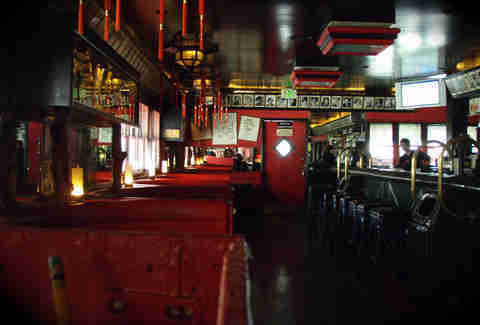 What began in 1925 as The Red Post­, a Red Car trolley-turned-luncheonette repurposed by former prizefighter Jimmy Bernstein, was expanded in 1934 to become the Cantonese-styled Formosa Café. From Bugsy Siegal and Mickey Cohen playing cards in a back room to John Wayne, Marilyn Monroe, and Elvis throwing them back at the bar, the Formosa might not still have the same star-draw, but recent renovations and a tweaked cocktail menu have helped to restore the vintage, let’s-drink-drinks-in-leather-banquets vibe. 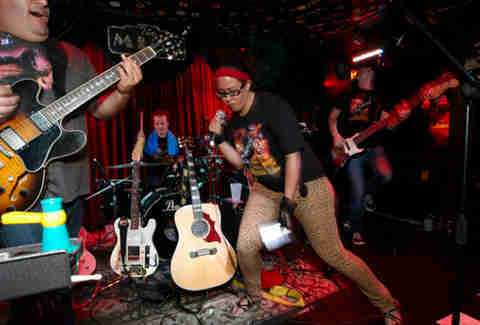 The oldest live music venue on the Westside, Harvelle’s still plays host to nightly shows of blues, jazz, and burlesque because, let’s face it, acrobatic lingerie-clad dancers never go out of style. 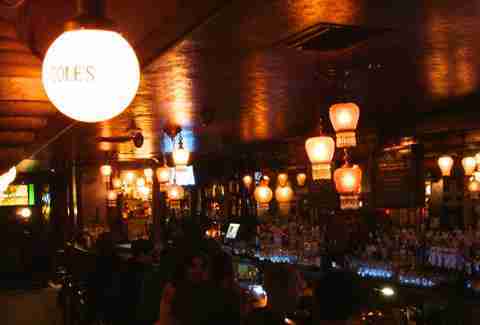 While the history of the Prohibition years at Harvelle’s remains murky, the dim red lighting, well-worn bar, and vintage boozy mirrors give the impression that these narrow digs have been pouring booze since day one. 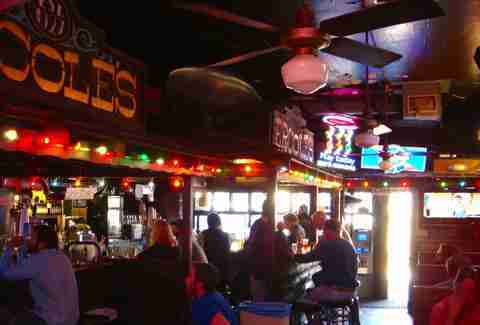 One of the few classic dives that hasn’t received a shiny new coat, Ercoles maintains the Cheers vibe, welcoming regulars with a glance-up-from-my-PBR hello, while you settle into well worn booths and stools. Sadly, you can no longer score lobster for 50¢ or tenderloin for 75¢ from the original menu, but three tacos for $5 on Tuesdays and two damn-fine griddle burgers for $6.25 on Wednesdays are pretty sweet deals these days. First opened as Menotti’s Bar, this Venice joint kept the party going underground during Prohibition, where guests would take two-person, rope-operated elevators down to the basement speakeasy, while groceries were sold upstairs at Menotti’s Buffet. The connected Menotti-owned ships would bring hooch from Canada, which was then carried by small boats under the former Abbot Kinney Pier and into the bar (and the rest of Venice) through subterranean service tunnels. After repeal in 1933, the speakeasy became the Club Del Monte, which has continued to operate to this day (with the help of a recent restoration), and is where you can now catch a burlesque show, standup comedy, and jazz while downing craft cocktails. Still battling Philippe for the enviable "oldest French dip in LA" crown, Cole’s P.E. 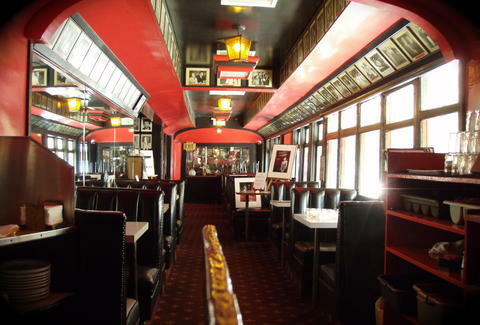 Buffet first opened its doors to thirsty commuters arriving on Red Car trolleys to the Pacific Electric terminal beginning in 1908. The bar endured the dry years with 3¢ bitters and 10¢ "near beers", but really made bank with the city’s first check-cashing service conveniently located within the bar. The recent Cedd Moses revamp added the speakeasy-style back bar, The Varnish, and a few modern touches (no more sawdust-covered floors! New pickled eggs! 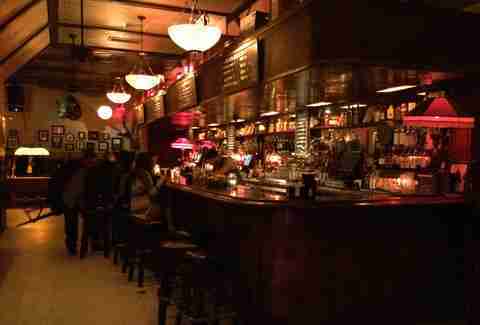 ), but hung onto the original, massive front mahogany bar, Tiffany lampshades, and old oak tables made from old railway cars. The surly old geezer of LA bars, this Skid Row-adjacent stalwart first opened as the tavern for the still-operating King Edward Hotel and managed to get a court order to keep the pesky street preachers of the day from scaring off would-be booze-hounds. During Prohibition, the space became a front where pianos were tuned upstairs, and people were tuned downstairs at the (soon-to-be-renovated) speakeasy, where booze was delivered through Downtown’s network of underground tunnels, and worn murals of kegs and cops can still be found. Since officially reopening in ’33, The King Eddy Saloon has famously poured heavy for Bukowski, Burroughs, and other literary liquor lovers, and, despite a recent refurbish featuring vintage radios and comic book noir-ish paintings, is still a solid cavernous dive that's good for losing a few hours. 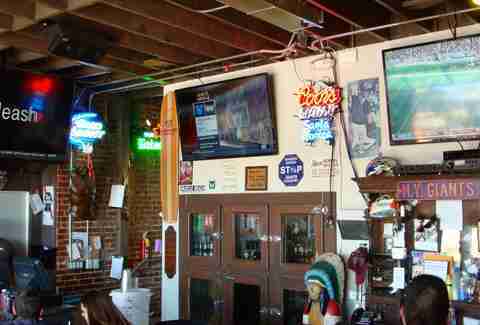 Sporting a rare dual-liquor license grandfathered from 1905, this Downtown dive still lets you grab a six-er on your way out the door from the "liquor to go" nook, currently curated by the craft-obsessed "Beer Chicks". 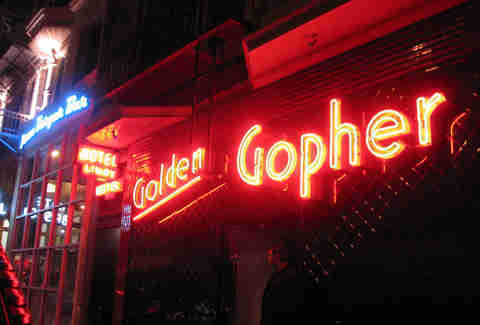 The Gopher survived Prohibition, like some other classic watering holes, by selling "near beer" and "medicinal" bitters, but remained dusty until receiving an overhaul in 2004 by cocktail impresario Cedd Moses. 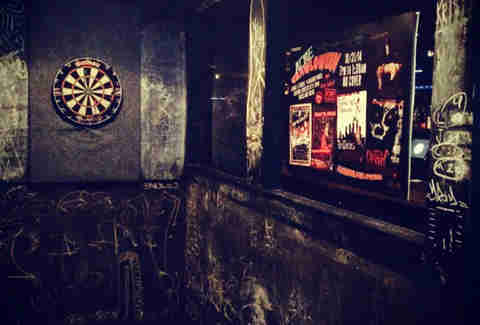 And, while the table-top Galaga and pool table may not have always been there, the man-pours, dark corners, and a smoking patio still lend historical grit to the place. Originally opened as Laring’s Lunch Room­ (six years before the SM pier was built! ), this open-air, beachside bungalow has lured in boozers through the decades -- including the classy likes of Cary Grant and Natalie Wood, and the even-more-classier Wilt Chamberlain, Evel Knievel, and, uh, The Governator. From the original 1913 icebox (converted into a walk-in cooler), to the 1950s shipping crates that line the walls, Big Dean’s maintains well-worn vintage charm while still serving up plenty of 32oz beers and packing the back patio on the weekends. Danny Jensen is a regular Thrillist contributor and can be found knocking on random doors Downtown, trying to find another speakeasy. 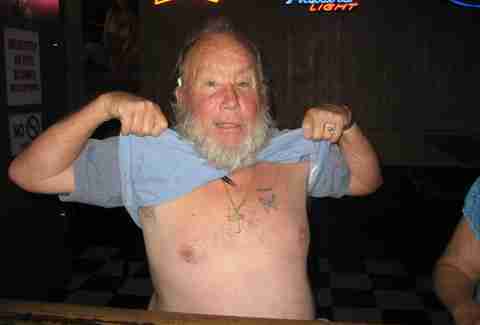 Buy him a drink on Twitter and Instagram.